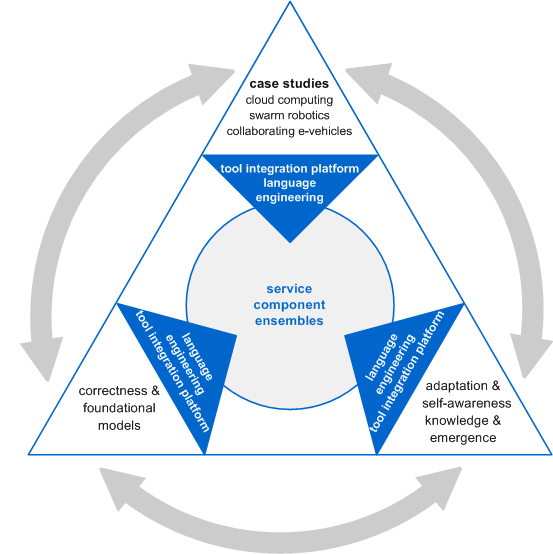 The ASCENS approach will focus on service-component ensembles (SCEs), hierarchical ensembles built from service components (SCs), simpler SCEs and knowledge units (K) connected via highly dynamic infrastructure. Service components are nodes that can cooperate, with different roles, in an open and non-deterministic environment. A service-component ensemble is a set of service components with dedicated knowledge units, to represent shared local and global knowledge basis about levels of awareness, resources, connectivity and networking, interconnected in a dynamic network, featuring goal-oriented, safe and secure execution and efficient resource management. To realize ensembles of service components, whose properties go far beyond the state of the art in current software engineering and technology, the following domains need to be thoroughly investigated, which become the concrete objectives of the project.